인류 최고의 물리학자 알베르트 아인슈타인의 행복이론 메모 2장이 24일(현지시간) 예루살렘 경매에서 각각 156만달러(약17억6000만원)와 24만달러(약2억7000만원)에 팔렸다고 AFP 통신이 보도했다. 이 메모 2장은 아인슈타인이 1922년 일본 도쿄 방문 당시 한 호텔에서 그에게 어떤 소식 전달차 들른 일본인 심부름꾼에게 팁을 대신해 준 것이다. "조용하고 검소한 생활이 끊임없는 불안에 묶인 성공을 추구하는 것보다 더 많은 기쁨을 가져다준다"
"뜻이 있는 곳에 길이 있다" "where there's a will, there's a way" 는 내용이 담겨있다. '위너' 경매업체는 "이스라엘에서 문서 경매 중 이번이 최고가"라고 밝혔다. 경매 실시 전 5000~8000달러에 팔릴 것으로 추정됐다. 아인슈타인 메모 구매자는 유럽인으로 익명을 요구한 것으로 전해졌다. 아인슈타인은 메모 전달 당시 일본인 심부름꾼에게 "아마 당신이 운이 좋으면, 이 메모가 보통의 팁보다 훨씬 더 가치가 있게 될 것"이라고 말했다. 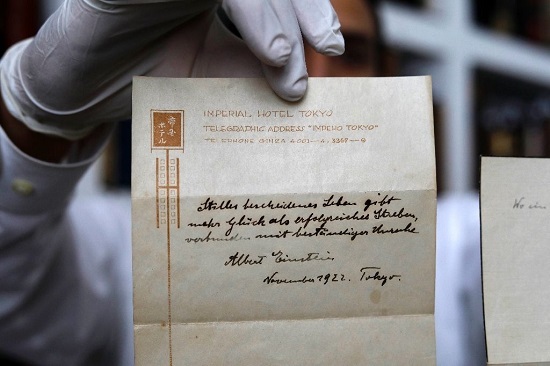 Jerusalem (AFP) - A note that Albert Einstein gave to a courier in Tokyo briefly describing his theory on happy living sold at auction in Jerusalem on Tuesday for $1.56 million (1.33 million euros), the auction house said. The winning bid for the note far exceeded the pre-auction estimate of between $5,000 and $8,000, according to the website of Winner's auction house. "It was an all-time record for an auction of a document in Israel," Winner's spokesman Meni Chadad told AFP. The buyer was a European who wished to remain anonymous, he said. The note, on Imperial Hotel Tokyo stationery, says in German that "a quiet and modest life brings more joy than a pursuit of success bound with constant unrest." Bidding, in person, online and by phone, started at $2,000. A flurry of offers pushed the price rapidly up for about 20 minutes until the final two potential buyers bid against each other by phone. Applause broke out in the room when the sale was announced. "I am really happy that there are people out there who are still interested in science and history and timeless deliveries in a world which is developing so fast," the seller told AFP on condition of anonymity after the sale. A second Einstein note written at the same time that simply reads "where there's a will, there's a way" sold for $240,000, Winner's said. 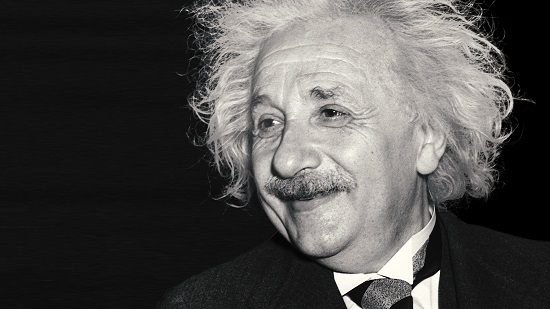 The German-born physicist, most famous for his theory of relativity, was on a lecture tour in Japan when he handwrote the autographed notes, previously unknown to researchers, in 1922. He had recently been informed that he was to receive the Nobel Prize for physics, and his fame outside of scientific circles was growing. A Japanese courier arrived at the Imperial Hotel in Tokyo to deliver Einstein a message. The courier either refused to accept a tip, in line with local practice, or Einstein had no small change available. Either way, Einstein didn't want the messenger to leave empty-handed, so he wrote him two notes by hand in German, according to the seller, a relative of the messenger. 천재 과학자 아인슈타인이 남긴 명언들이다. 지식인은 문제를 해결하고 천재는 이를 예방한다. 한 번도 실수를 해보지 않은 사람은 한 번도 새로운 것을 시도한 적이 없는 사람이다. 나는 똑똑한 것이 아니라 단지 더 오래 고민할 뿐이다. 지식보다 더 중요한 것은 상상력이다. 자기 자신의 무지를 과소평가하지 마라.